Ten years ago, an Interweave editor and the heads of three yarn companies sat in a West Coast hotel room hashing out the details of a new kind of knitting magazine. One of those people was our very own Betsy Perry (owner of Classic Elite Yarns). The result? Knitscene was born, 'a magazine for knitters who can't get enough of knitting' (according to the Editor Note in the very first issue). 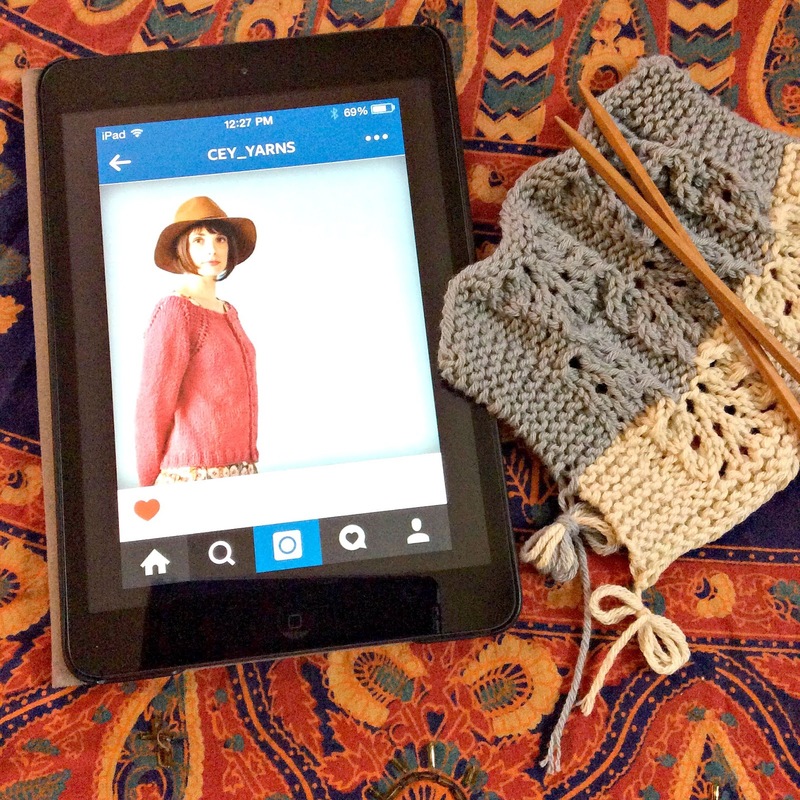 Lots of things have come and gone in the knitting world since 2005, but CEY's flagship yarn La Gran which was featured in the premiere issue is still going strong. This yarn was featured in two of the first Knitscene patterns. One of these is the 'La Gran Pom Pom Scarf' that was spotlighted as the free pattern in our Web-Letter this week. The other is the #05 Tweed Jacket, a lovely mix of La Gran and Inca Alpaca. With one strand of mohair and two strands of alpaca held together as you knit, the fabric created is interesting and unique. How would you mix and match colorways to create a fabric all your own? Inca Alpaca is another long running CEY yarn. The softness of this yarn makes it ideal for anything that will cozy up against your skin like the #06 Neck Warmer, also from the premiere issue of Knitscene. Two strands of alpaca are held together as you knit giving you ever so many possibilities of color combinations. Choosing two similar hues will result in a tonal look. Picking two contrasting hues to hold together gives more of a tweedy feel. My favorite patterns are the ones like these that give us, as knitters, enough room to let our own personal choices really shine. Congratulations to Knitscene on the last 10 years and here's to many more to come! 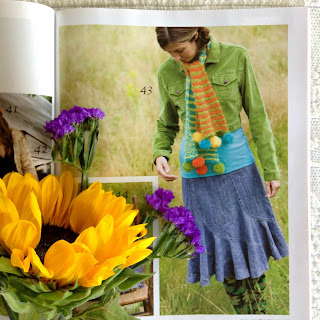 We at CEY are so glad to be part of the magazine that "brings you the stuff of knitters' dreams. Now wake up and get clicking!". Something new is always happening here at CEY. Make sure you are in the loop to hear all the latest news. Just 'like' or 'follow' or 'favorite' us on your preferred social media platforms to stay connected. Joining in the conversation over on Twitter. Following us on Instagram. We're @cey_yarns. Being a part of the fun over in our Ravelry group. Checking back weekly for more information, in depth reviews, helpful hints and new techniques here on the CEY blog. Sign-up here for free great designs delivered right to your inbox weekly via our Web-Letter. With so many ways to keep in touch, which will you choose to use? In music, one guitar is not like the next. Each has its own distinct tone. But it is not just the instrument playing the note which determines the sound. The way the note is actually played makes a world of difference in what we hear. In our newest pattern book, Sing, the yarns are like different instruments. The drape of Bella Lino, the squish of Sprout, the merging color tones of Mesa and the versatile fiber mix of Song all play their own tunes in the knit pieces. It's the way these yarns are 'played,' the details of novel construction and the chosen stitches themselves that really make the patterns ring out loud and strong. 'Unforgettable' a 3/4 length sleeve cardigan in Song. The textured yoke of 'Unforgettable' elevates a classic raglan cardigan to something memorable. 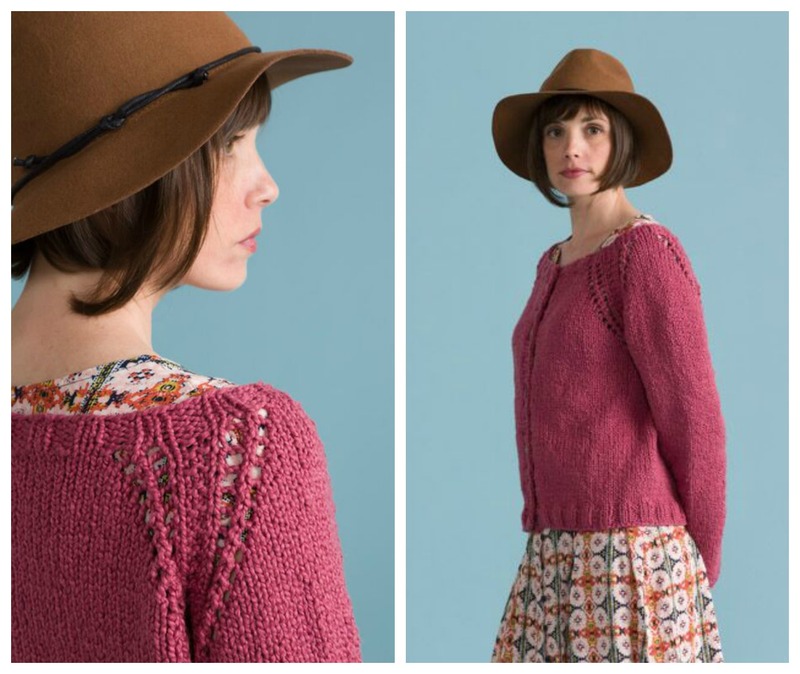 This pattern uses our new yarn Song whose cotton and wool combo make this a great knit for humming through from late summer into early fall. 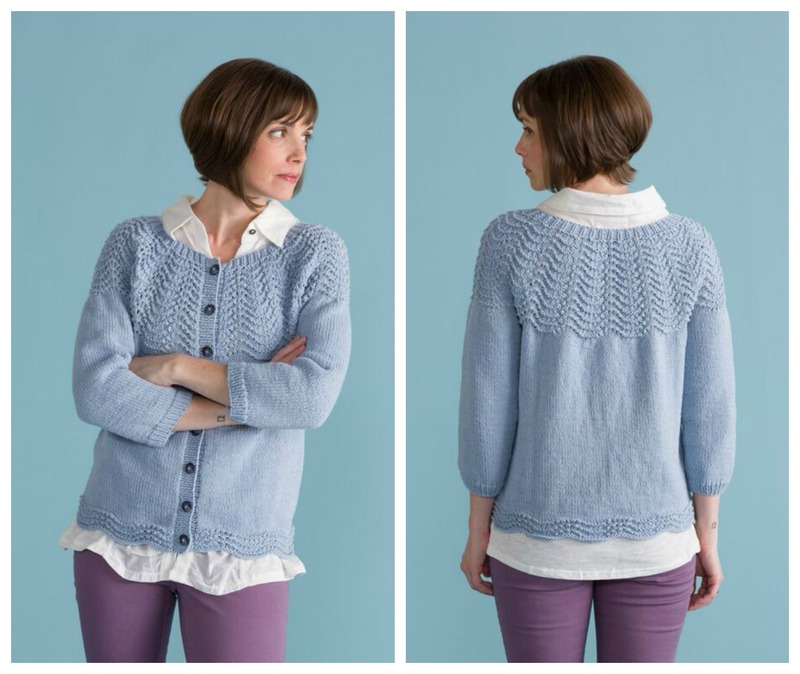 'Stand By Me' by Susan Mills in Bella Lino. The unexpected construction combined with an airy lace stitch in 'Stand By Me' allows the self-striping Bella Lino to shine. 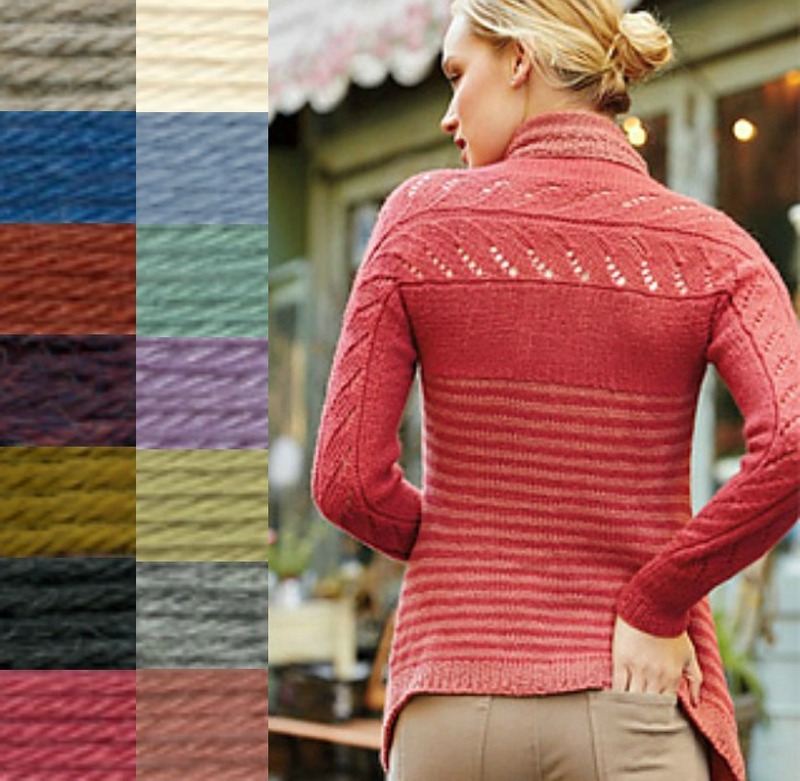 It also duets with the lightness and drape of the yarn to compose the beautiful flow of the sweater fronts. 'Heart of Gold' in Verde Collection Sprout. See the way that 'Heart of Gold' shines a little spotlight on the soft texture of Sprout? And the large eyelets dotting the upper body work in beautiful harmony with the top down construction. It's the extra touches that cause a lilting melody to get stuck in our heads and become a part of our day. For me it's the details of patterns like these that make me want to knit them and then urge me to keep them at the top of the playlist that is my closet for years to come. 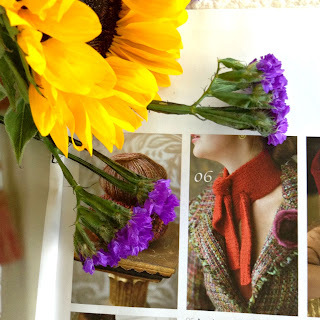 It is always exciting to see how a magazine editor or an independent designer will envision one of our yarns being used. Recently CEY yarns were featured in three different patterns in three new magazine issues. First, we saw the Bartram Vest by Cassie Castillo in Interweave Knits Summer. 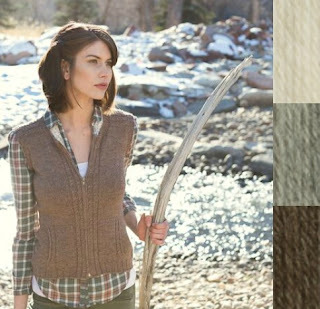 Look how they've taken the natural, undyed shades of Mohawk Wool and set them in the great outdoors. What a perfect match! Photo by Harper Point Photography. Copyright Interweave. Next up Interweave Crochet revealed the Lattice Lace Shrug by Lei Wilkins. 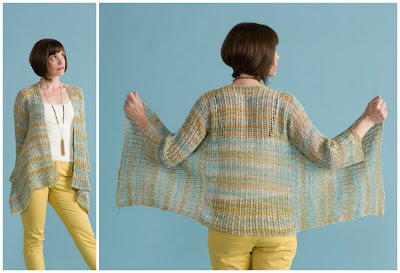 The drape of Firefly is such a perfect fit with this flowing vest. They must have had Firefly's light-catching sheen in mind, knowing that it would really pop when this piece is in motion. Most recently, Veera Valimaki's Multi-Directional Cardigan was released in the Early Fall issue of Vogue Knitting. The softness of Inca Alpaca matches the softness of the setting, and is put to good use in this two color piece. There are so many possible color combinations. Would you choose a tone on tone combination or two colors with a stronger contrast? 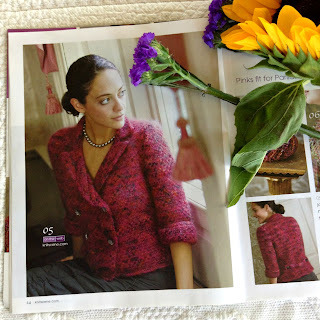 VOGUE Knitting Early Fall 2015. Photo by Rose Callahan. As much as we are moved by the vision of the editors and designers on these magazine pages, it is the next step that is our favorite. Now you, the knitters and crocheters, will choose your colors and make the patterns your own. Seeing what you come up with inspires us the most.